There have been posts and talk around the blogosphere about a September challenge. Throughout the summer, I’ve been feeling like I haven’t been giving this space enough of my attention. Part of that is because I have a teething, almost 13-month-old who needs her Mama’s attention and love and soothing milk the majority of the day and another part is that I’m feeling less than inspired these days and I’m thinking a challenge will give me that bloggy pick me up. I really liked this post on filling your “soul hole” and then this morning came across this post and the “three for thirty” idea I really liked too. Also check out this TED talk and this one for added inspiration. I know we are already on day 4 of September so I have a few days to make up, but I think I’m going to give this 30 day challenge thing a go, both for the creative inspiration I hope to get from doing something every day and the routine of adding something soulfully healthy into my life. I will call my challenge Soulful September. I have been drawn lately to the principles and philosophies of Buddhism and I would really love to learn more ways to enjoy the world around me, spend more time reflecting and meditating, as well as reading as much as I can about the wisdom of Buddhist teachings. Every day of Soulful September I will read (something inspiring hopefully), move (either walking outside, yoga or swim), write (journal, gratitudes, blog) and meditate (this will be the toughest for me. Finding the time and just reflecting quietly, has always been difficult for me). These four things seem like soulful additions to my every day life yet simple enough to hopefully keep up with every day for a month. Read, Move, Write, Meditate -once a day for thirty days. I will keep you up-to-date about my Soulful September happenings once a week here. And would love it if you would join me with this challenge or anything similar you are doing this month. 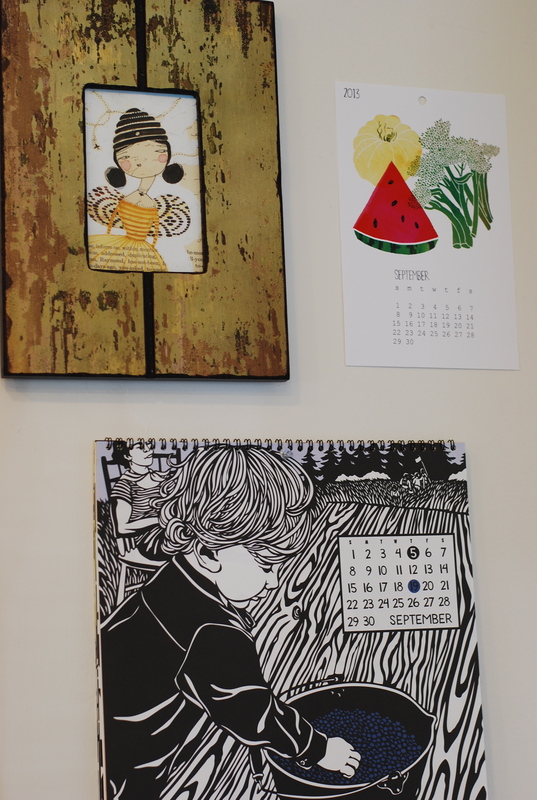 * calendars by Claudia Pearson and Nikki McClure and Bee girl art from here. (All inspirational art for me)! This entry was posted in Soulful September and tagged 30 day challenge, bettering myself, soulful september. Bookmark the permalink. Wonderful. Good for you and good for the earth. That’s true, I”m certain of it. When I do my morning meditation time, after reading something inspirational, I take three deep breaths and slowly let the breath out with an ohm if possible but make it easy, then sit, hands up in that wicker chair ( can’t sit on the floor anymore and get back up), hear the clock ticking or focus on my breathing, let my mind wander, which it does now, then I usually doze off but even so, I feel wonderful afterwards, so don’t fret if you don’t feel like you’re in some higher state, even though you just might get there anyway. I usually spend about fifteen or twenty minutes including the reading and the meditating. It truly is good for everyone. I will join you in your quest this month. I love this! Thank you for your morning routine. I will try it out this month for sure! And I’m so glad to hear you’re going to join me! Keep me updated on your challenge too! Love you!